140 characters is not a lot, but some of the poker players manage to be very funny in such a short message, it seems. The 6th Annual BLUFF Magazine Reader’s Choice Awards presented the top 5 funniest poker twitters recently. If you are in for some fun, and I know you are, here's the list with 1-1 quote from the person, just so can get a feel for what is going on about them. Why is it ok for people to applaud when the plane lands but everyone gives me a look when I do it on the shuttle bus? It is quite well-known that Phil Hellmuth likes to show off and be in the spotlight. Once a legendary poker player, Hellmuth only gets on the news because of some humongously stupid act these days. This time, he is trying to market his brand new High Stakes Hold'em game with a quite amateur video and an improvised rap performance. This might sound funny at first, but it is in fact totally awkward. You must all be familiar with John 'JimmyLegs' Wray, who's an animator genius. He has done many awesome videos so far, but now he seems to have started his own show in cooperation with Jay 'KRANTZ' Rosenkrantz, The Micros. It's about 3 micro stakes players, who "after months of frustration, finally have a shot to break into the big leagues." Check it out, it's fun. If you like it, you can subscribe to the show's YouTube channel. "We would spend part of the day at the Lexington Hearing Center with Bill Clinton (and) then head off to Clinton's charity event..."
"My wife and I were honored to sit right next to Bill (at) the Gala dinner!" My fellow grinders, Tony G is all over the place. Literally. PartyPoker's sponsored pro is now available as an online table decoration for PartyPoker's players. If you'd like some "G" spirit on your virtual tables, now is your time. Part VII of Eponymous’ Photoshop comic strip ‘The Godfather of Online Poker’ has arrived: a peace treaty is made between the poker rooms and Patrik assumes control of the Corleones. 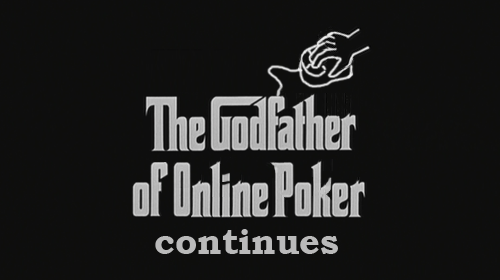 Part VI of Eponymous’ Photoshop comic strip ‘The Godfather of Online Poker’ is here, in which the tension between the Five Sites is increasing, Gustav Corleone draws dead one last time and Patrik also experiences a serious downswing. 2+2 provides room for talents to exercise their creativity (and knowledge of Photoshop) from time to time – mostly at the expense of poker pros. After providing quite a number of humorous pictures of Viktor Blom, now it was time for the poker elite to became integral parts of the video game universe. Bobby Crosby is an internationally recognized comic creator, the writer of the PlusEV comics, one of the most popular poker-related comic strips of all times. It introduces us to the life of an American family, in which the father spends most of his time playing poker. Soon enough, all members of the family develop some kind of a relationship with both live and online poker, and find themselves in all kinds of funny situations. It is a must-see for all poker fans! Here’s a hilarious video I found at the Cake Poker Blog to kick off this nice day, and I felt I must share this with you.The video portrays a donk stopping by TwoPlusTwo, the popular poker portal. He expresses his unique and awesome ideas about poker and he has some good questions as well. Check it out, brilliant stuff! Eponymus’ Photoshop comic strip ‘The Godfather of Online Poker’ continues with Part V, in which Patrik Corleone makes a pass at Maria Ho, we get to meet Don Tonygi and the XOR encryption is as a piece of cake to crack as ever. Last week, we saw the start of a series of videos by Chris Olaafson, claimed (by himself) to be the best poker player in the world. The humorous video featured Daniel Negreanu, Tiffany Michelle and Arnaud Mattern, all praising Chris, calling him the God of Poker and other honorable titles. The Chris Olaafson Story goes on, the second part of the series was made public yesterday, and you now have the opportunity to watch it below. In this part, Chris (once again, with the help of several poker celebrities) tries to convince the audience that he is truly the best poker player in the whole wide world, and that the training program he offers will unveil tactics and strategies never seen or heard of before, to make the average player a poker monster. The third video, appearing on the 30th August, will allegedly already contain the first lesson, and I, together with all the poker players out there, am eagerly waiting for it. Not only because of the knowledge that Chris claims to possess, but also out of curiosity, whether the next part will contain at least one sentence to be taken seriously.